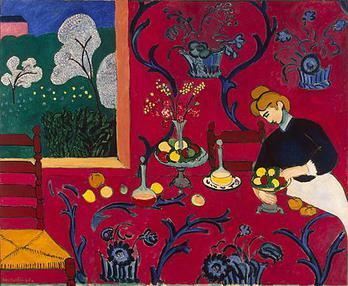 Henri Matisse, The Dessert: Harmony in Red (best known as The Red Room), 1908.
oil on canvas, 70.9" x 86.6"
This wonderful Red painting which was in Paris for the show Ciwt went to see is considered one of Matisse's masterpieces. It also has a host of scholars who have written or lectured about how inventive it was for Matisse to have painted the red color last, defying the classic manner since the renaissance of painting the ground color first. On and on these art experts go about how the red comes right up to the blue in some sections, how brave and quietly defiant Matisse was to have painted in such an unorthox way, how inventive, how sly. On and on as Ciwt said. Well, not so fast, experts. When Count Schchukin saw and contracted with Matisse to buy The Red Room, it was entitled Study in Blue. Because it was blue - everywhere you see red. But after Schchukin returned to Russia and before the painting was sent, Matisse decided it would work better in red. And voila. So the painting Schchukin took possession turned out to be red. His reaction: uncrate it and proudly hang it on his wall beside his growing collection of Matisses. This trust in an artist is nearly unheard of. Most collectors would have a fit, demand their money back, maybe even take the artist to court if a painting they had paid for arrived totally changed. Such was Schchukin's deep understanding and belief in Matisse that he knew Matisse's/the artist's process was of supreme importance. No over analyzing for him.